It has been a tradition for West Bend High Schools orchestra students to travel to Scotland, but this time, Scotland came to them. Fiddle duo Alasdair Fraser and Natalie Haas, famous for their traditional Scottish tunes, did workshops with the high school orchestra students both Monday and Tuesday afternoon. The pair’s main focus was to help the young musicians add the taste of Scotland to the music that they plan to perform when they visit the country in March. 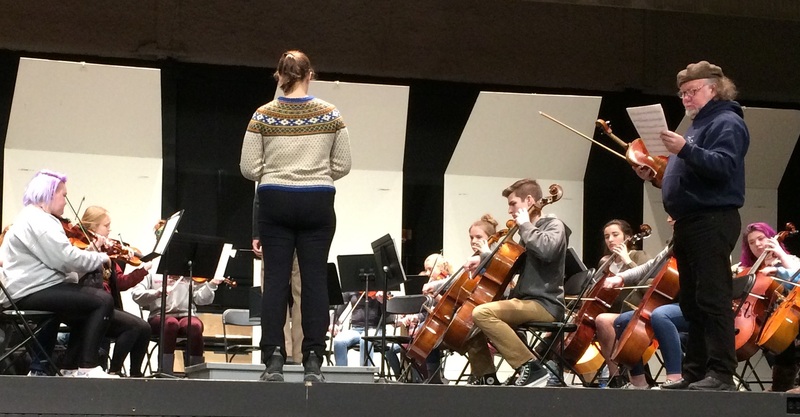 This once-in-a-lifetime opportunity culminated in a concert Tuesday night, which included the performances of not only the orchestra students, but Fraser and Haas as well. During the Monday workshop, which was only available to those planning to attend the Scotland trip, the students brought along some traditional folk music to work on with Fraser and Haas. They also learned to play a snippet of the duo’s very own compositions. In general, the musicians focused on different techniques to express the spirited emotions that their Scottish music was meant to convey. The Tuesday workshop was much different. Because it was open to all orchestra students, those who attended did not come with the intention of improving music previously provided to them. Instead, Fraser and Haas taught them a special piece that was later performed during the concert finale Tuesday evening. Fraser also immensely enjoyed working with the students. Natalie Haas and Alasdair Fraser work with students on the stage during Monday’s workshop. Photo by Samantha Dietel, Current Staff. The musicians did more than just emphasize different playing techniques to help the students with their expression. During the workshops, Fraser often repeated to students the importance of finding their true passion for playing their instruments. Additionally, Fraser voiced his beliefs of just how important music is. The students found the workshops to be incredibly valuable as well. Morgan Wahouske, a West sophomore and violin player, reflected on her experience with the musical celebrities. Another student, East sophomore Emily Larson, also found the workshop to be very helpful. “We worked on a bunch of stuff that we can really use and will really help us when we go to Scotland,” Larson said. She also believes that the orchestra department should continue to do fundraisers so that the school can have more workshops with professional musicians in the future. Wahouske similarly felt that more workshops would be greatly beneficial to the success and development of the orchestras. “If we could have more workshops and just more time with people who do the workshops—if we could have had a week with (Fraser and Haas), I probably could have learned so much more,” she said.